Most investors know diversification is a good idea. That’s where Double Eagles come in. This asset class has significantly outperformed bullion and has held its value during periods when gold bullion prices dropped. Private Pre-1933 $20 Saint Gaudens Double Eagles Choice Uncirculated Certified & Bar Coded. A Historical low ratio vs A modern 1oz. Gold American Eagle. 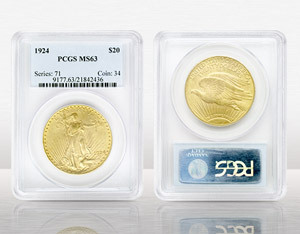 Both $20 Saint Gaudens and Liberty Double Eagles (common dates CHOICE uncirculated) are the rare coins that most often mimic the movements of gold bullion. When gold is trading up, Pre-1933 certified Double Eagles trade up, and vice versa. They will track gold price movements, as evidenced by the chart above, but once gold starts a significant run, they have always significantly outperformed gold prices at the same time. You can expect more privacy and better performance. Certified uncirculated old gold coins, pre-1933, are at the lowest premium in history. In the past, the Double Eagles have been worth 2-3 times the amount of 1 oz. gold. This is an opportune time to buy the Double Eagles while the ratio is low and sell them back, or trade them in for regular gold, when the ratio is high. Essentially, you can double your holdings. Since 2003, the Double Eagle premium has fluctuated from a low of 1.10 above gold to a high of 2.41. Right now, we are on the front end of that cycle again, and the ratio is even better than EVER! What’s more, they come in beautiful packages. Before the U.S. outlawed private ownership of gold (this ban lasted until 1974), we were in the “golden age” of American coinage. Some of the greatest artists and sculptors in America designed our coins, making them not just financial investments, but beautiful works of art. So if the idea of holding a century-old piece of art in your hand thrills you…or if you like the idea of stabilizing your portfolio and decreasing your risk…then you’ll definitely want to invest in these Double Eagles. Based on the past eight years, there is a tremendous buying opportunity based on the premiums of the Double Eagles vs. gold. Currently, the ratio stands around 1.20 ounces of gold equals 1 Double Eagles. As the price of gold rises, the premiums will have no choice but to increase creating a better profit potential than gold moving forward. Over the last 30 years these coins in MS64 have been trading at 2 to 3 times the spot gold price. So we are recommending that you trade your modern bullion coins for certified $20 Double Eagles and position yourself for a double play return in the future. If you currently do not own or have no interest in the trading 1oz. gold bullion Eagles, you can simply buy in to the Double Eagles at this historical low ratio and experience the same benefits. Take a look at our great selection here. Literally and aesthetically, they just don’t make coins like these anymore. In closing, the premium has all but evaporated, creating a window of opportunity to experience private capital gains not only by the price of gold rising, but by the spread/premium regaining its normal ratio. In addition, all transactions are private and there are no additional fees.